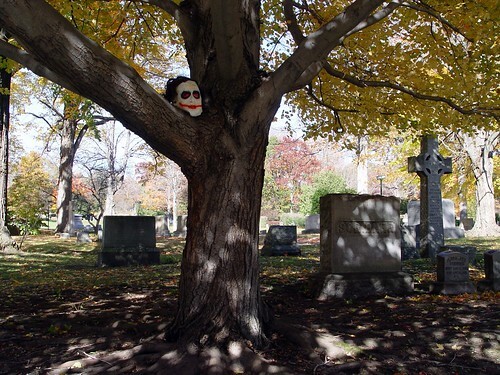 In my opinion, you have to be very, very brave to be the one Halloween decorating in a graveyard. Great idea! I’m just wondering if you left the head in the tree? Are you serious?! LOL That’s just creepy…seriously creepy! Remind me never to walk in a graveyard with you! Too cool! and a great idea. funny, the tombstones are already there. In our neighborhood they have much the same decor, but they had to put the headstones along with the skeletons. Perfect for this week and for you too!! BTW consider yourself BOOED! Happy Halloween. Spookey shot – perfect for halloween! This is totally your time of year, isn’t it? Is this part of your costume…or just something to make you giggle? Great shot none the less! oh my goodness…that is a great shot for this time of year…. Oh, now that is positively creepy. Cool. As my mom and I like to walk through the cemetary and just look at the headstones, I can vividly imagine her shock/surprise/”Good God! What the hell is that?” if we were to come across something like that!!! On my blog I have awarded you the “Kreativ Blogger Award”…enjoy!